Distressed homes - foreclosures and short sales sold at deep discounts - accounted for 22 percent of November sales (12 percent were foreclosures and 10 percent were short sales), down from 24 percent in October and 29 percent in November 2011. 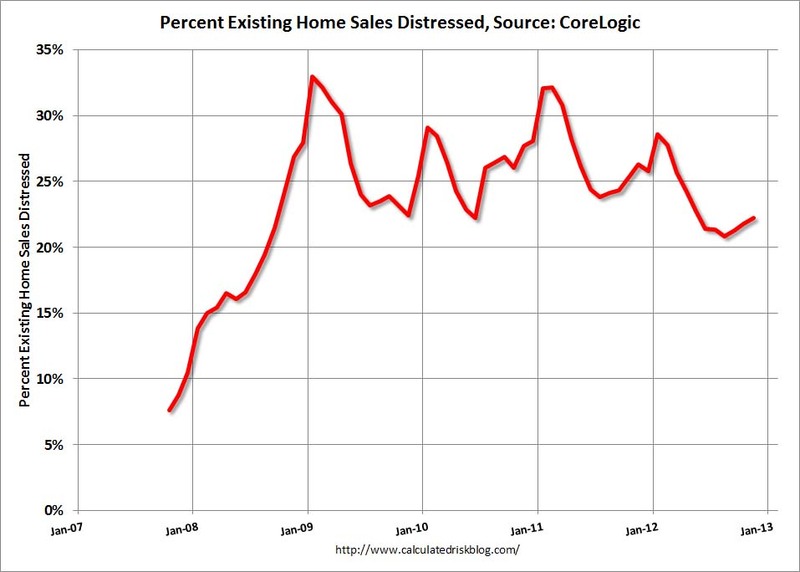 Unfortunately the NAR uses an unscientific survey to estimate distressed sales. However CoreLogic estimates the percent of distressed sales each month - and they were kind enough to send me their series. The first graph below shows CoreLogic's estimate of the distressed share starting in October 2007. Note that the percent distressed increases every winter. This is because distressed sales happen all year, and conventional sales follow the normal seasonal pattern of stronger in the spring and summer, and weaker in the winter. The seasonal impact of distressed sales is why the Case-Shiller seasonal adjustment increased in recent years. Also note that the percent of distressed sales over the last 6 months is at the lowest level since mid-2008, but still very high. This is the lowest percent of distressed sales for November since 2007. 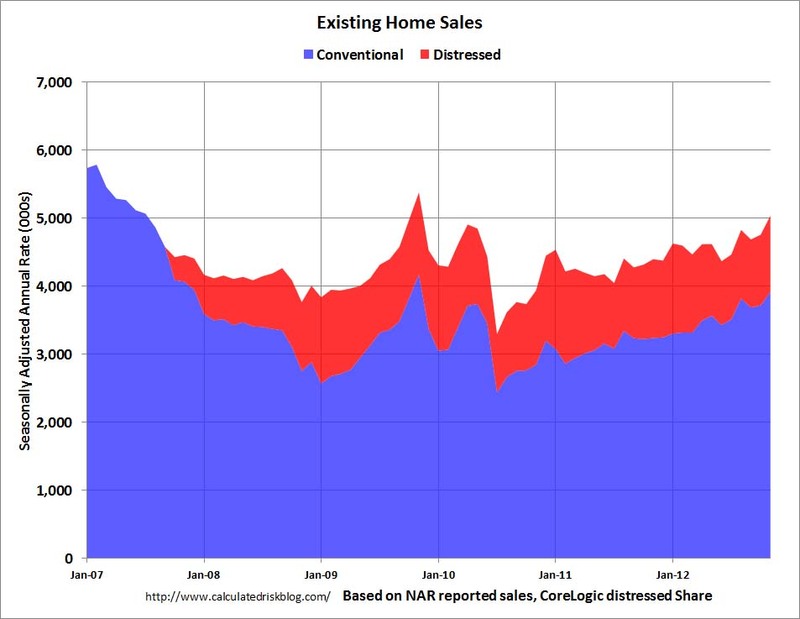 The second graph shows the NAR existing home series using the CoreLogic share of distressed sales. If we just look at conventional sales (blue), sales declined from over 7 million in 2005 (graph starts in 2007) to a low of under 2.5 million. Using this method (NAR's estimate for sales, CoreLogic estimate of share), conventional sales have recovered significantly. The NAR reported total sales were up 14.5% year-over-year in November, but using this method, conventional sales were up almost 20.9% year-over-year.